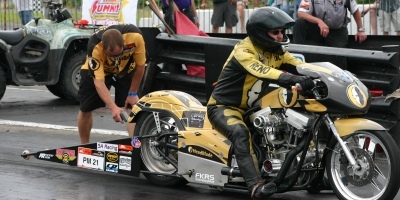 Shaun Reno’s smooth racing style with Team HeadBlade was somewhat quieted at Rockingham Dragway at the AHDRA’s Nitro Nationals presented by the Carolina Dealers Assoc. There’s nothing a drag racer dislikes more than running a team mate in the first round of eliminations. But the quailifying ladder put Reno, a 3 time AHDRA Pro Stock Champion, up against Capone Racing’s Frank Capone in the AHDRA Pro Modified Class. It was Capone’s reaction time, an almost perfect light .004 with a 8.491 ET at 147.92 mph that put Capone to the big end of the track first. Reno’s yellow and black Pro Mod was packed back in the trailer after a very respectable 8.601 ET at 146.61 mph is home preparing for the next race on the circuit, Atco, NJ’s Screamin’ Eagle Performance Parts AHDRA Northeast NitroNationals, May 19th and 20th. It should be mentioned that this was a closest field in the history on Pro Modified, only .5 of a second separated the 8 bike qualifying field. This will be a very interesting and wildly exciting season for this very experimental gas powered field. Look for Team HeadBlade on the Interstates of American chasing national points.